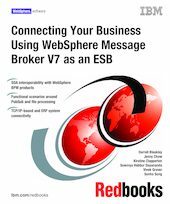 This IBM® Redbooks® publication points out the key features that make WebSphere® Message Broker a powerful choice as an enterprise service bus (ESB) solution in a service-oriented architecture (SOA) environment. In this book, we illustrate the interoperability between the WebSphere Message Broker and the applications in the SOA environment. We use realistic examples to show the ESB capabilities of WebSphere Message Broker. We also show how to integrate WebSphere Message Broker with a variety of enterprise applications, which include WebSphere Process Server and ESB systems including SAP and Siebel, WebSphere Business Monitor, and WebSphere Service Registry and Repository. We wrote this book for architects who are planning an SOA solution and application designers who are implementing an SOA solution with WebSphere Process Server and WebSphere Message Broker.